SMITHFIELD, Va., May 02 /CSRwire/ - Today, Smithfield Foods, Inc. released the Animal Care section of its 2017 Sustainability Report focusing on the company’s industry-leading practices to keep animals safe, comfortable, and healthy. Starting today, Smithfield will issue its 17th Sustainability Report in segments organized by the pillars of its comprehensive sustainability program each week during the month of May. 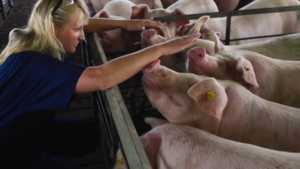 To support the release of the Animal Care section of this new report, Smithfield has also released a new 360-degree virtual reality video, which transports viewers to one of the company’s wean-to-finish hog farms. The company leveraged this technology earlier this year – the first protein company to do so – to take viewers inside a company sow farm. First company to commit to group housing systems for pregnant sows on company-owned farms. Today, all pregnant sows on company-owned farms globally, including joint ventures in Mexico, are housed in groups. First and only company in the industry to report antibiotics usage (since 2007). First pork producer to develop and implement a comprehensive, systematic animal welfare management program. First protein company to release virtual reality videos of its hog farms. In addition to information about these topics, the report also includes details about Smithfield’s ongoing research to investigate alternatives to antibiotics, including a new vaccine research lab, results of internal and third-party animal care audits, and the company’s efforts to continually enhance its animal care management system. To view a video about Smithfield’s animal care program, click here. To read the Animal Care section of the report in its entirety, please visit www.smithfieldfoods.com/animalcare.